I have a case of the boo-hum-bugs. What is that, you say? Let's just say that if you called me the Scrooge of fall/Halloween decor, I wouldn't correct you (see my Easter thoughts here near the bottom of the post). Don't get me wrong, I love fall. We get very distinct seasons where we live, and as much as I anxiously await summers arrival, fall is a close second for me. The change in the leaves. Despite my abundance of praise for fall, I just can't seem to get into autumnal decor. You won't see a hurricane vase of acorns or a runner made of faux leaves sewed together on this blog. I have absolutely nothing against seasonal decor of this variety, it's just not my jar of jam. My home is all whites and blues and greys, and fall decor just doesn't jive. I prefer to put my creative fall energy into seasonal eats. That way, they aren't on display, I can share them with others, and they get eaten instead of sitting in a storage box until next fall (yay for less stuff!). There are a lot of fall recipes I've wanted to try, but when my grandma gave me a huge bag of almonds (poor grammy has high potassium and can't eat them anymore), I decided to blend one of my favourite desserts with my favourite healthy snack. 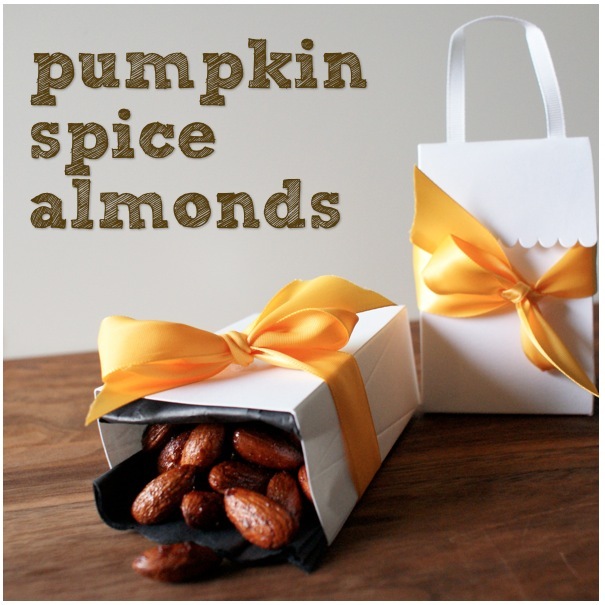 Pumpkin pie spiced almonds. Yummmy. As is usually the case with my "original" ideas, I did some googling and of course, my idea isn't so original (is there such a thing anymore?). Go figure. Anyways, instead of reinventing the wheel, I used Robin's recipe tweaked just a bit (I added a little rum extract because I was short on vanilla, and it turned out yumm!). Check out her blog for the exact recipe, but I'm talking easy ingredients here! Agave nectar, vanilla extract, cinnamon, pumpkin spice. Yup, that's it. Oh, and a sprinkle of sea salt. Toss in the oven for 18- 20 minutes, and voila! 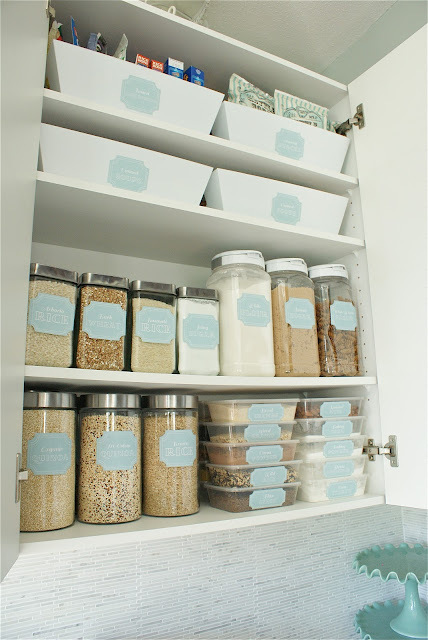 Your home will smell heavenly, and you'll have some delicious, non-refined sugar candied almonds. They still retain a bit of stickiness as the agave doesn't seem to caramelize like sugar would, but not super sticky. I would call it more tacky than sticky. It won't leave your fingers amuck, which is nice. The sea salt on top is divine. I love that it blends sweet and salty, and the pumpkin spice isn't overwhelming in any way. Since you don't want to eat these all to yourself, pack some up and hand out to friends and family. My favourite packaging tip is to scour the stationery sections of Winners/TJMaxx/Ross etc for wedding favour boxes. I found this set of 24 for just $3.99 and I use them for everything (wrapping small jewelry gifts for friends, toys for my cousins, and now almonds!). Much cheaper than buying them from Michaels and they're nice to have on hand when you need them. 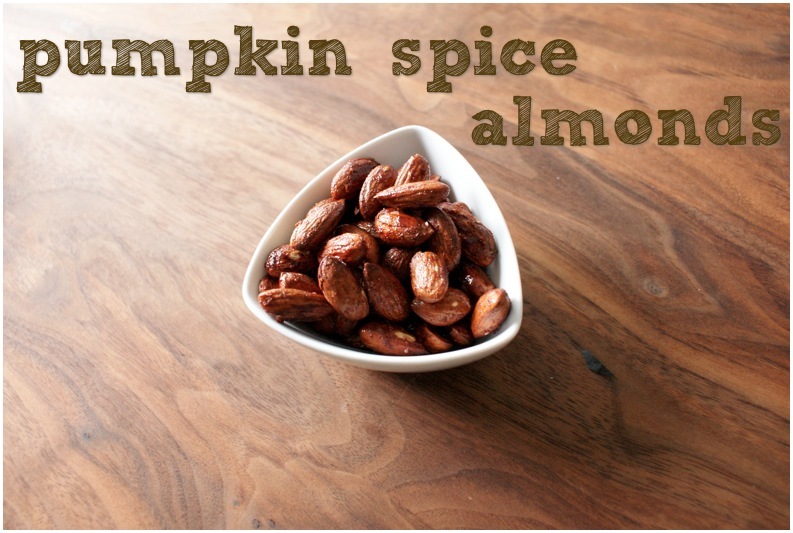 If you have some almonds lying around your kitchen, I definitely recommend giving this a go. Can be made into teeny tiny batches too so you aren't as tempted to eat a whole pan! Yesssss.... I just posted about my tablescape and that I'm not down with seasonal decor (unless it's Christmas, at which time I lose all of my senses). It doesn't go with my house either, and it's just not my favourite thing. I best leave it to those who rock it :) And this sounds so easy, I'll have to try it this week!! 1. Was laughing to myself about your feelings towards seasonal decor. Could not agree more, and I actually have been immediately unfollowing people's pinterest boards dedicated to images of those "hurricane vases of acorns" ahha. Something about it just kind of irritates me, is that weird? 2. LOVE the idea for this recipe, and handing them out as little packages to friends! Might have to try this! Haha, oh Annie, I'm so happy I'm not the only one! I don't think we're weird at all! Don't worry, I'll be posting a DIY on a faux leaf runner tomorrow. The spiced nuts look AMAZING. On my to-make list! You had me worried for a moment! Lol. Although I'm sure you would have a way of making faux maple leaves look good! I'm right there with you on the fall decor thing. It is beautiful to see in other people's homes and on the internet but no way does it end up in my house all season. The only "fall" decor I have is an orange/red leaf patterned table cloth that only comes out on Thanksgiving day and a couple of fake gourds/pumpkins that end up in a vase with some branches. On Black Friday they are delegated back to the attic storage container. It's just so exhausting. Some years I don't even want to decorate for Christmas.